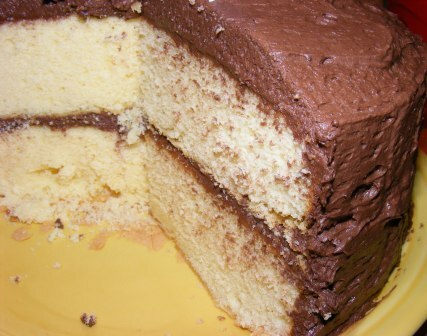 Yellow cake with chocolate frosting is my favorite birthday cake too. And my mother’s tried-and-true frosting was cocoa and butter and powdered sugar. I think it had some egg in it also – we didn’t worry about raw eggs back then. I’m not sure if Mom used butter in hers. I know it had powdered sugar, cocoa, and milk. Oh, I love that idea of three candles for “those of a certain age,” so I hope it’s okay if we steal that…a birthday cake should have some sort of fireworks on it is my feeling! Thanks, Phyl! We always did that. I thought it was a Midwest thing. We have a tradition of only using three candles (representing past, present, and future) for those of a certain age. So, yes, there were candles, but, no, they didn’t set off the smoke detector. I am really enjoying this group. Thanks for putting it together and keeping it going! I’m going to up my participation in this next section. I hope we can arrange some Twitterbakes for some of the recipes, too. Thanks for the reminder on the links, too. I always forget to do that. I went back and added links to you, Abby, and Margaret.